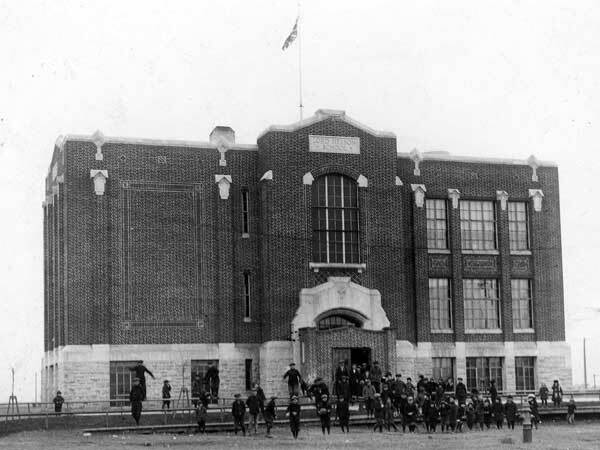 Around 1909, the Winnipeg School Board purchased a plot of land along McPhillips Street that was just large enough to build a two-storey, four-classroom school, at the northeast corner of McPhillips Street and Redwood Avenue. Known originally as the McPhillips Street School, it was later renamed Lord Nelson School in commemoration of British naval admiral, Lord Nelson (1758-1805). The growth of the surrounding area was such that Lord Nelson School No. 1 was quickly overcrowded so the Board purchased an entire lot across the street from the original site. In 1917, the Board erected the brick, two-storey, six-room Lord Nelson School No. 2, the first part of what was anticipated to eventually become a 24-classroom structure. 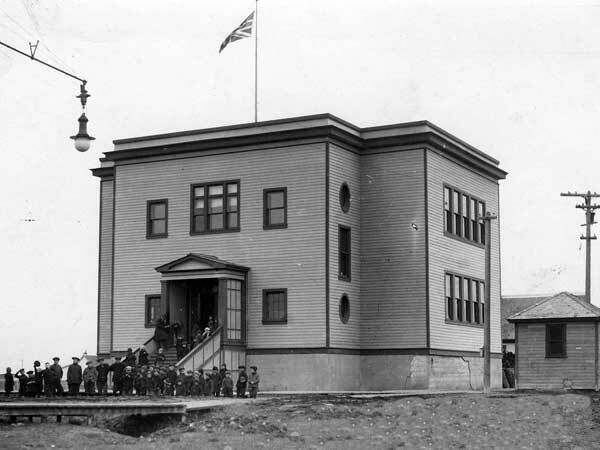 Located about 200 feet east of the original building, its cornerstone was laid at a ceremony on 19 October 1917 attended by Premier T. C. Norris and Navy League (Winnipeg Branch) President W. R. Allan. By 1922, when four more rooms were built, enrollment at the school was around 550 students. Seven classrooms were added in 1949 and, in 1958, a one-storey annex of eight rooms was built. Among the other teachers of Lord Nelson School was Arthur Foster Brown. “Ceremony at Lord Nelson School,” Manitoba Free Press, 20 October 1917, page 12. “Winnipeg schools, No. 28—Lord Nelson,” Manitoba Free Press, 17 November 1922, page 11. “Board announces changes,” Winnipeg Free Press, 13 May 1970, page 57.